Here is a link to The Primitive Standard. 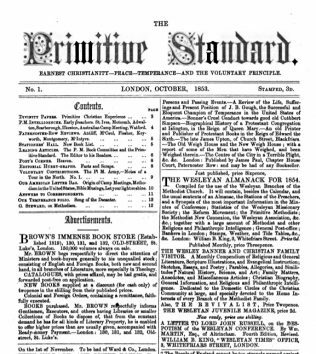 This Primitive Methodist journal was shortlived, published from 1853-54 by John Wombell, under the editorship of Thomas Church. It did not have the approval of the Primitive Methodist Book Room, and comments about the Connexional Book Committee are revealing. 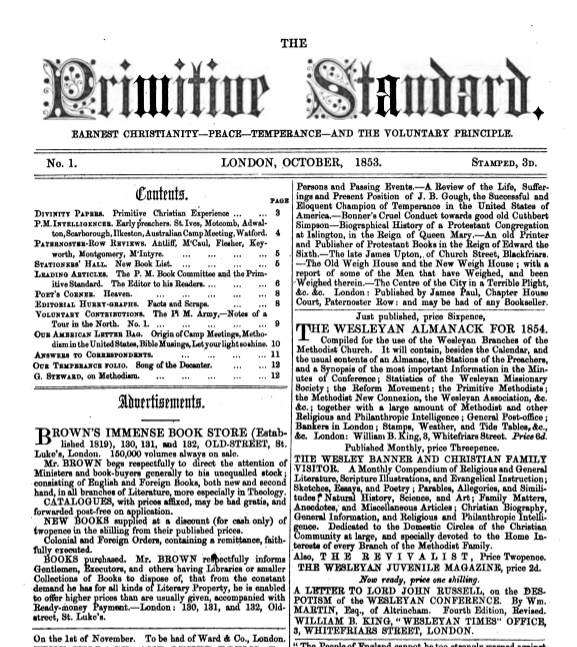 It was seen as a competitor to The Primitive Methodist Magazine. The Standard provides a revivalist voice, advocates peace on the eve of the Crimean War, and reveals a surprisingly ecumenical stance. It includes chapel openings and anniversaries, and gives a fascinating window into Primitive Methodism in America and Australia, including the challenge of geography when holding Camp Meetings. A novel, Harley Beckford begins in the third edition but was never completed in the magazine, but here is a link to the Haithi Trust’s digital version.